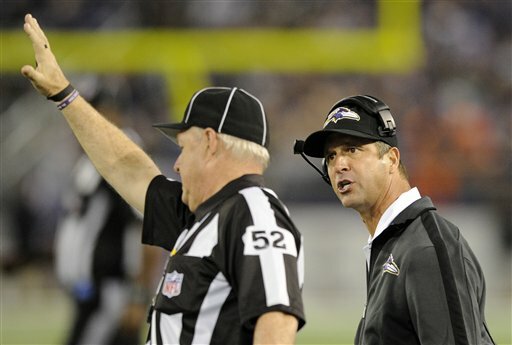 Navy football fans have another reason to dislike NFL replacement officials. While the rest of the football world focuses on the last play of last night’s Seattle-Green Bay game (Seen any good stories lately? Probably a few. ), a familiar name has popped up on the list of refs the league has used in the place of its locked-out men in black (and white). A quick history lesson: In 1999, a few decades deep into Notre Dame’s win streak over Navy, the Mids had a 24-21 lead in South Bend with less than 90 seconds to play. Notre Dame faced a 4th-and-10 and appeared to gain nine or so yards on a pass play, a result that would’ve ended the drive, broken the streak and sent Annapolis into hysterics. Instead, the spot earned the Irish a first down, prolonging what would become the game-winning touchdown march. The line judge responsible for the spot? Perry Hudspeth. The line judge in Sunday’s Redskins-Bengals game, which had its own fourth-quarter ref antics? Take a guess (scroll to the bottom). Hudspeth’s retirement from officiating apparently lasted one season. Second, as anyone who’s ever attended a youth sporting event is keenly aware, sports officiating may be the most thankless job in all of athletics. Rarely will a position reward its best and brightest with complete anonymity (OK, aside from Mr. Biceps over here) and turn a single mistake into a career-defining debacle. Third, Hudspeth’s 38-year officiating career gives him decidedly more experience than some of the other replacements who have been thrust into the national spotlight. Other officials have come from the Lingerie Football League or low-level college ball, according to the New York Times. Also, sometimes they’re apparently recruited via New Orleans Saints fan sites — briefly, at least. So despite what Navy fans may think of Hudspeth’s spot-making prowess, he’s a natural choice for NFL replacement duty, and a cadre of officials with his level of experience likely would’ve avoided many of the problems the league’s faced this season. Of course, a few more statements like this one and the labor talks could speed up, sending Hudspeth and his fellow replacement officials back into retirement. Or lingerie football. Or maybe not. Hudspeth? Hudspeth? That cheat? He does not belong on any football field! John Feinstein is one of many who see how an official used to cheat and get away with it! I suppose it is useless to point out that Hudspeth’s spot was reviewed after the game by ACC supervisors responsible for grading out their officials game performances and Hudspeth’s spot was not challenged. Full disclosure requires that I acknowledge that I am a retired Navy officer and personal friends with Perry.